Collect entire Sb3d region (up to 550eV), making sure both Sb3d5/2 and Sb3d3/2 components are acquired. Sb3d region has well separated spin-orbit components (Δ=9.39 eV). Peak shape for antimony metal is approximately symmetric. Direct overlap between Sb3d5/2 and O1s peaks. Use Sb3d3/2, which does not overlap with O1s, as a guide for any peak fitting. Intensity and binding energy of Sb3d5/2 peak is set by the Sb3d3/2 peak, according to the spin-orbit splitting and ratio. 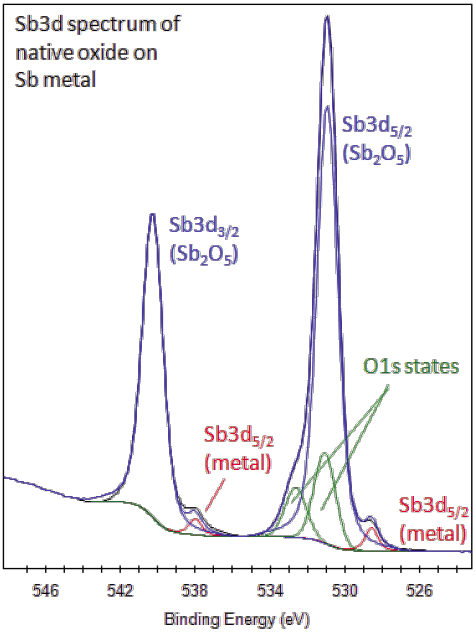 Remainder of intensity under at Sb3d5/2 energy can then be attributed to oxygen. Antimony is used to harden other metals. In particular, it is widely used to harden lead for batteries. This semiconductor is also used to produce diodes and infrared detectors. Antimony trioxide is used in flame retardant substances such as aircraft and automobile seat covers along with clothing and toys for children. The sulfide of antimony, stibnite, was used as medicine and cosmetics during Biblical times. The name for stibnite was passed on to the Greeks and eventually gave rise to the Latin term stibium. 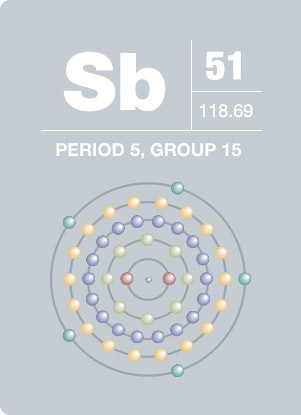 Jacob Berzelius, inventor of modern chemical notation, used Sb as an abbreviation for antimony in his writings, and this became its elemental symbol.